Bow pose or Dhanur Asana is perhaps the face of yoga. It is another one of those yoga poses that is worth incorporating into your daily practice. It is not as difficult as Wheel Pose, which is detailed in the article, Advanced Yoga Technique – Wheel Pose, but it provides many of the same benefits and a few more when done the special Kundalini Yoga way. Bow pose is again common to both hatha yoga and kundalini yoga and thus, is a part of both the e-books that are available on Mastery of Meditation. The Free Online Hatha Yoga Poses Galleries and the Free Illustrated Kundalini Yoga Poses E-Book. Bow pose has a long list of benefits, specially for the entire digestive system, but the technique employed by kundalini yoga when practicing this posture, is the real secret for unleashing it’s full potential. In kundalini yoga, we rock back and forth in bow pose, thus giving our entire abdominal area a terrific massage. 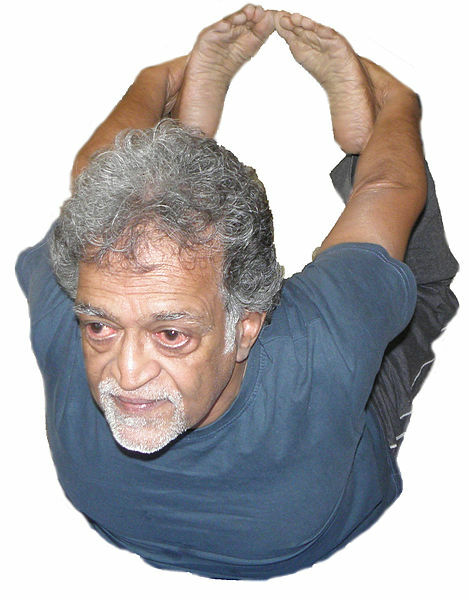 Practicing bow pose in this way is reputed to help you maintain eternal youth. 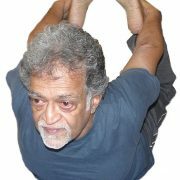 Although that might be a slight exaggeration, my yoga teacher Ravi Singh, pointed out that he knows of a particular yogi in California who rocks in bow pose for 20 minutes daily, and his age was impossible to tell. Of course, don’t jump ahead to this advanced method, until you have first mastered the basics of this posture. If you are looking for more information on Kundalini Yoga practice. I recommend the following 3 articles as good starting points: Introduction to Kundailni Yoga, 10 Important Guidelines for Kundalini Yoga Practice and Dangers of Kundalini Yoga. Below you will find an illustration of Bow Pose (Dhanur Asana) and details regarding this fundamental yoga posture. Start by lying on your stomach with your chin on the floor. Next, bend your knees and bring your heels towards your buttocks. Beginner Yogis: Reach back and grasp your ankles, keeping the rest of your body on the floor. Pull your heels into your buttocks. 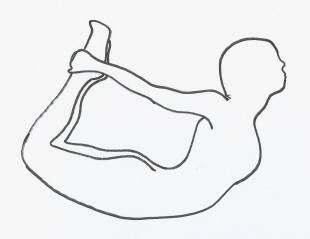 Intermediate Yogis: Raise yourself up off the floor as shown in the illustration above, by pressing your ankles away from you. Your chest and thighs should be raised off the floor. Advanced Yogis: Rock back and forth in bow pose, inhaling as you come forward, exhaling on the way back. 15 seconds – 5 minutes. The ultimate yoga pose to improve and perfect your digestive system. Excellent for your respiratory system, to relieve breathing problems and ailments such as asthma, etc. Good for the entire spine and back. Great pose for improving the overall flexibility of the entire body. Helps improve overall health and wellbeing. Progress gently towards the advanced version. For some, even the beginner version is difficult to get into, in which case just bring your heels as close to your buttocks as you can, and reach as far back with your arms as possible. Do not eat for at least 2-3 hours before practicing this posture, or you will be quite uncomfortable. Careful of your knees and back when doing this pose. Thanks for your feedback and glad you are enjoying the website. The breathing for bow, when you rock is correct. Inhale forward and exhale back. This is primarily because as you rock back you put pressure on your abdominal region, thus it is a better suited to exhale. inhale to go back, exhale to go forward? Heart Chakra Balancing Yoga Video for Love & Forgiveness Understanding Non-Duality, Hinduism, Buddhism, Enlightenment & Life!